There has been a polar-blast today... even Auckland has felt it, not getting over 9.6oC ALL DAY! I don't think I have been SO grateful for our lovely warm fire as I am right now :-)! 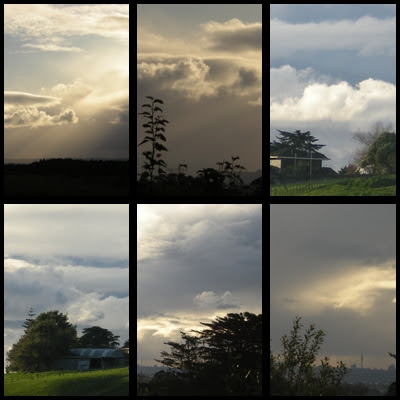 However, despite that - I braved the elements late this afternoon to take some photos of the gorgeous sky & cloud formations for your viewing pleasure (and for posterity of course)! They look like snow clouds to me (says she who has never seen 'snow clouds' in my life)! I needed something to cheer me up though, Button and I shared a tummy bug (just a slight one - hence why she was off-colour) last week... both managed to bounce back over the weekend. Then this morning I woke up to a diarrhea filled nappy, three times - urghhh! I know, I know - too much information; but that's what you get on blogs ;-)!!!! 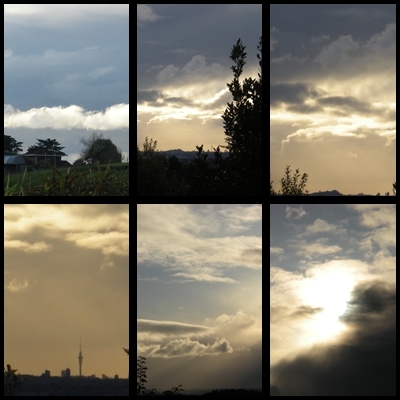 Anyway, hope these pictures take your breath away just like the gorgeous landscape (sky-scape?) did for me late this afternoon! The clouds look amazing! Enjoy your warm fire! I am still in my dressing gown (over my clothes) and still feeling cold! Great photos - we had some pretty impressive clouds around here too!! Hope you're all feeling well again - nothing like winter bugs and childhood illnesses to drag a Mama down.